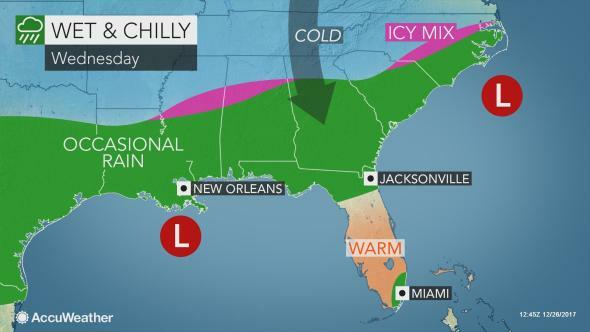 Following spotty ice on Wednesday, a colder storm may bring an icy mix and hazardous travel to part of the Southeastern states on Thursday and Thursday night. A couple of storms are forecast to slice across the South then off the coast before the end of this week. The first storm will produce rain as the primary form of precipitation from Louisiana to coastal North Carolina on Tuesday night and Wednesday. However, on the northern edge of this first storm and its rain, the air may be just cold enough to allow a bit of sleet and snow from northern Louisiana to parts of central and northern Mississippi and Alabama, northern Georgia, upstate South Carolina and central North Carolina. A second and colder storm is likely to track a bit farther to the south and east on Thursday and Thursday night. "The amount of moisture that is available to the second storm is questionable and may limit the amount of sleet and freezing rain," according to AccuWeather Senior Meteorologist Kristina Pydynowski. "At this time, there is the potential for enough ice to glaze surfaces from a large part of Georgia to much of South Carolina and central and eastern parts of North Carolina," Pydynowski said. While a small amount of sleet or freezing rain will not bring down power lines, it can make for very dangerous travel conditions by foot or wheel. Portions of Interstates 16, 20, 26, 40, 75, 77, 85 and 95 may be slippery. These surfaces may appear to be be wet but may be icy, especially on bridges and overpasses. 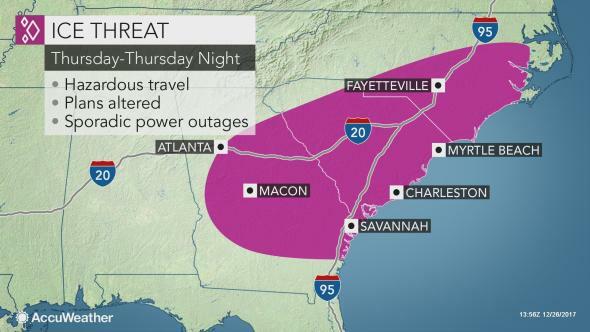 Cities at risk for some icy or wintry precipitation include Atlanta, Macon, Augusta and Savannah, Georgia; Greenville, Columbia, Charleston and Myrtle Beach, South Carolina; and Charlotte, Fayetteville, Wilmington and Raleigh, North Carolina. Storm brings white Christmas to parts of the U.S.
Should the storm develop quickly, some ice and snow may fall as far to the west as parts of Alabama, Mississippi and Louisiana on Thursday. If dry air rushes in quickly during Wednesday night, the air may be too dry to bring much more than very spotty sleet and snowflakes throughout the Southeast states. The same storm may join up with a storm from the Midwest in the Northeast states on Saturday. Should the two storms merge quickly and hug the coast, a significant snowstorm may unfold in the Northeast, which may hinder travel to and from some the major airport hubs. Crews and aircraft may also be displaced in such an event. Even colder air is forecast to pour southeastward this weekend through the first week of 2018. There is a chance a major storm occurs before the coldest air of the season so far arrives for the southeastern part of the nation around New Year's Eve and New Year's Day.